I'm going to start this second newsletter with a very difficult subject. 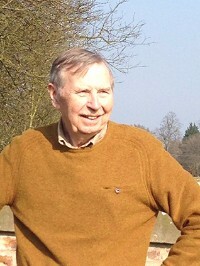 I'm heartbroken to say that my rock, my mate, my dad - Bob Bartholomew, passed away in August after a battle with pulmonary fibrosis. I apologise if the following short tribute seems self-indulgent but my dad was a big part of my life and it seems wrong to not include it. My dad has always been a huge support to me – even when I chose to be an artist rather than getting a 'proper job'! In fact, his idea to document the closing of the coal mines, by producing a series of paintings underground, turned out to be the springboard that launched my career. He watched every development since with pride and encouragement and, along with mum, has been involved with the gallery for many years, transporting artwork to and from our framing workshop. He and mum travelled around the country to almost every exhibition I’ve had. He would always be available to help and his interest never wavered. His support was constant. I hope I never took these things for granted because without them, my journey would have been very different and, who knows, might not have happened at all. I'm going to miss him more than I can say. Rest in peace Dad. At the beginning of August I went to the Isle of Wight for Cowes Week. I’ve been intending to make this a subject every year for about 10 years but for one reason or another, never quite made it. Cowes Week is a sailing regatta where up to 1,000 boats, from small, privately owned dinghies to 100ft maxi yachts sail through the Solent with up to 40 races a day. 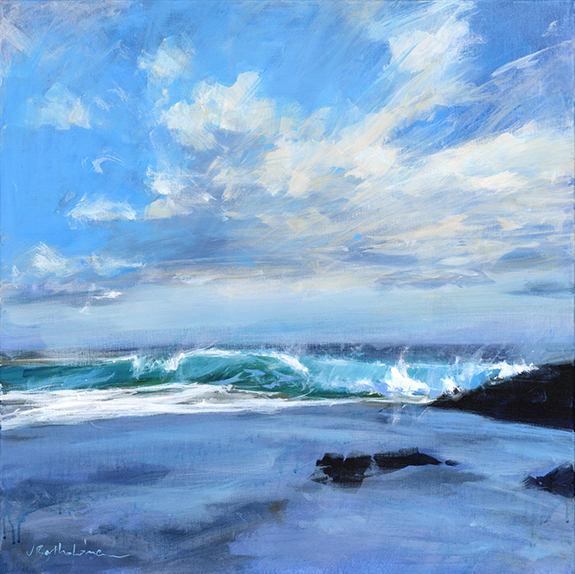 My paintings are generally about light, colour and hopefully a bit of drama, so all fingers were crossed for a few bright, sunny days, ideally with choppy conditions, colourful sails and some dynamic racing positions. I tried to improve the odds by booking accommodation and transport for a 3-day trip, thinking surely this would give me lots to go at and plenty of chance for some good weather. It’s the Isle of Wight in August after all (!). “All but 2 races cancelled due to 40mph gusts and dangerous seas”!! This was incredibly disappointing and frustrating. Fortunately however, a healthy dollop of good luck lay ahead that was going to make the whole trip worthwhile and that would have been almost impossible to plan. Surprisingly, one of the spectator boats was still willing to venture out into the waves to get close up to the maxi yachts as they returned to the finish line (one of only two races that did go ahead that day). “I won’t lie,” the captain warned me before casting off, “it’s gonna be rough out there”. Since the alternative was to go home with virtually nothing to work from, I didn’t really care! After about 30 minutes of powering out to sea, we were positioned right in front of the first of the finishers. Right on cue, a little gap opened in the clouds, and shafts of sunlight lit up the turbulent water. 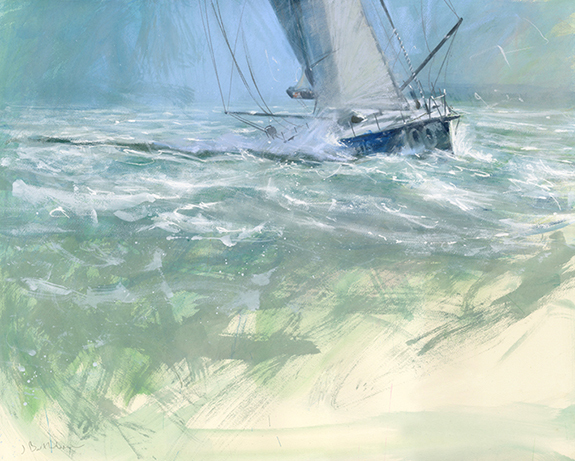 Seconds later, the first of the maxi yachts, its mainsail at an alarming angle, powered towards us – its bow smashing through the rough water - creating explosions of white froth that were lit up by the sun. It was incredible to watch and we followed it for just a few minutes before it left us behind. It was a fleeting rendezvous, but gave me exactly what I wanted for my next group of paintings. It’s extremely difficult to be in the right place at the right time for this kind of subject. No amount of planning can guarantee it, especially when conditions are so changeable. But it meant that on balance, I could go home feeling lucky! Since returning from my trip to Ireland before the summer, I’ve been busy with a series of new paintings in acrylic and oil. As I mentioned in the last newsletter, this has been ‘outer comfort zone’ stuff but I’m really pleased with how they are working out. I think the breakthrough came at the point when I stopped chasing any specific results that I had in mind and let the paintings take their own course. I’m particularly pleased with two little 12 x 12’’ studies that emerged a few weeks ago. Both good examples of the best results happening when you least expect it. Which leads me to an announcement - I’ve decided to have an exhibition at the gallery towards the end of November to show these paintings for the first time and also my new sailing work from Cowes. This will be the first exhibition I’ve had at my own gallery in several years so I’m really looking forward to it. We’ll have a preview evening on Thursday 23rd November and all are warmly invited – I’ll get the wine in!